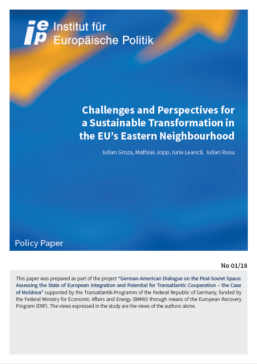 The policy paper aims to make an assessment of the impact of the Eastern Partnership (EaP) on the reform processes in the EaP countries, with a particular focus on the associated countries and to address in more detail the major challenges to the EaP’s power of transformation in the region. Further it presents the core elements of the “EaP – 20 deliverables for 2020” endorsed by the recent EaP Summit in Brussels and introduces a set of key priorities for the future. The authors share the opinion that the EaP needs further impetus in order to become more effective in supporting transformation and stability in its Eastern Neighborhood. This paper was prepared in the framework of the German-American Dialogue on the post-Soviet space, and served as background for the fourth workshop held at the end of November 2017 in Berlin. The workshop report can be found here. The project was implemented in cooperation with the German Marshall Fund of the United States, with support of the Transatlantik-Programm of the Federal Republic of Germany funded by the Federal Ministry for Economic Affairs and Energy (BMWi) through means of the European Recovery Program (ERP).